it comes on waves ebbing and flowing. What if I had done it differently…? Someday It Will Be is an homage to a love lost and gone forever. It's reminiscent; precious moments frozen in time and a deep connection that can't be erased neither by time nor by death. Present and past blended together perfectly but the story is mostly told in flashbacks and the reader is privy to Poe's life as he's given a chance to change the course of life. In a way it's a second chance at love and life, albeit an imaginary opportunity. Beautiful. (view spoiler) That's purely hypothetical. On the other hand, it's a needed plot device in the context of WHAT IF and that's fine by me. Only five months after his death, the memories of Isaac's voice, his smell and his laugh were fading in Poe's mind. The more he consciously buried the memories to maintain his sanity, the more he lost of Isaac. It was the only way he knew to survive. But with every piece of Isaac that he forgot, he abandoned a part of himself. So instead of fighting against the pain of seeing what he had lost, he welcomed it. He let the fissure break open and took in every detail of this Isaac. The tilt of Isaac's chin when he laughed. The way he used his hands when he spoke, every word so important that it deserved physical emphasis. How he would lean in to whisper as if no one else in the world was privileged enough to hear what was said between them. Poe watched the billowing black clouds approach. On the horizon sheets of rain were falling, streaking the rays of the fast-setting sun. "And you know what's really fucked up about fear? You're most afraid of the things that will never happen. 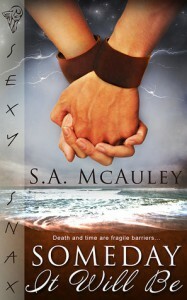 (…)"
Someday It Will Be was my first read by S.A. McAuley and it's safe to say it won't be my last. A beautifully written short story filled with plenty of emotion that accomplished to hold my attention from start to finish. I loved it.